Hello everyone, today I will share a small tool XIAOMI TWRP Recovery Flasher Tool. 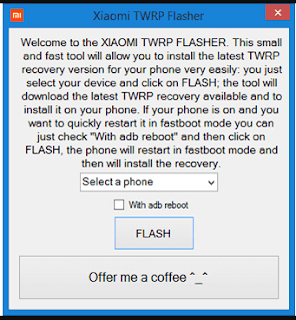 XIAOMI TWRP Recovery Flasher Tool is windows Application which help you to install TWRP recovery on Xiaomi device., It's support more than 14 xiaomi device in this version more device will comes in next update, Download XIAOMI TWRP Recovery Flasher Tool on this page and check this tool i hope you like this tool. This tool can install TWRP Recovery via Fastboot command then click FLASH and will download Flash Recovery automatically (if recovery is downloaded then it will not download anymore). When you start running XIAOMI TWRP Flasher, the application automatically checks for updates and will ask you whether you want to download or not.